woowww!! estan preciosas me gustaron todas! Thank you so much for entering my candy draw, unfortunately Stampin' Up! will onyl let me send products to people who live in the UK. As I mentioned on my blog it is open to UK residents only. Sorry about that, I am not sorry that you popped by as I have found your beauitful and quirky blog - I LOVE YOUR STYLE. Estan preciosas, ademas tienen un colorido hermoso y ademas...las fotos en si estan buenisimas!!!! El martes sale algo para vos!! Thank you for entering my blog candy, best of luck to you! 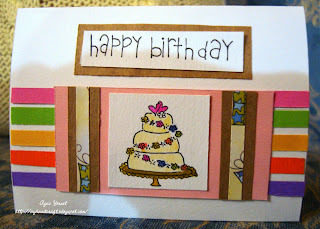 I love your cards and your blog, you are very talented. She is 9 years old. Hope you give her a visit. Hello Agus, Thank you for entering my blog candy. Hi agus, it's sue morris. :) I see we have the same layout for our blogs! Your work is lovely!